TaskUs promises four things: people, process, technology and transformational growth. As a progressive, new-age outsourcer, they are flexible, agile and quick to respond to clients’ shifting needs. With a unique focus on growth, TaskUs sits at the intersection of people and technology to deliver deep expertise in cloud-based digital customer services. TaskUs has a large workforce totaling 7500+ employees and is expecting a 50% growth in their workforce over the next year. As they planned operationally for this growth, TaskUs realized their existing manual onboarding processes were prone to human errors and would not be able to accommodate this scale without negatively impacting their overall productivity. Traditionally, these tasks have all involved a significant amount of manual intervention and tracking which can be expensive and inefficient. TaskUs was looking for scalability and flexibility along with a standards-based solution. They needed to find a reliable and experienced partner to complete the project within 18 weeks. The solution that OSI delivered was based upon business process flows that evolved over time at TaskUs. Although most processes were manual before this project, the flows were proven. Using Oracle SOACS, the majority of the processes were automated, while still allowing for human intervention to direct the flow of activities as needed. Finally, requirements related to scalability, manageability, and monitoring were addressed with the implementation of these robust tools under the Oracle stack. 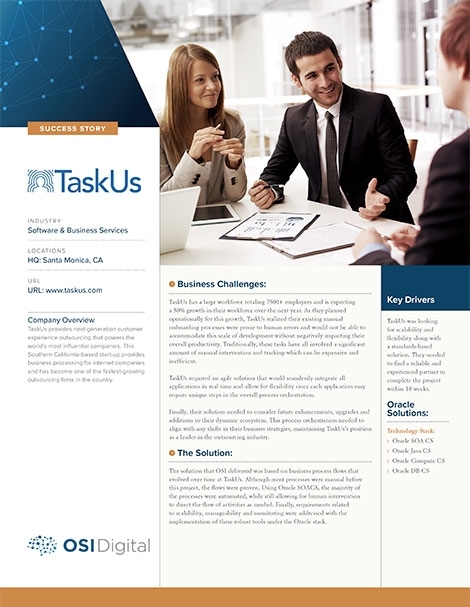 TaskUs and OSI Digital partnered to design and build a SOA-based solution to address their employee on-boarding capacity challenge.